What to Do After a Car Accident - Platinum Lending LTD. There is not much that will take you more off guard than a car accident. No one ever expects one to occur, but when they do your mind can be thrown into a frenzy. It’s important to know what steps you should take in order to make sure you handle the situation in the best way possible. The first and most important steps involve making sure you are okay and getting out of any further harms way. You definitely don’t want to make a bad situation worse. Once you are in a safe position, contact the authorities. You may need an ambulance and you will definitely need a police officer there to create an official record of the occurrence. If you are able to do so, make sure you gather evidence. Take pictures of your car, write down what happened in your own words and keep these items in a safe place. It’s best to do this right away so that you don’t forget any details that might become important later on. In the end you will be filing a police report and then likely will file a claim with your insurance company. As long as you followed the steps above this should be a smooth and painless process. The process of getting your car fixed and having your insurance claim paid will likely take a couple of weeks. It’s important to keep accurate records of every actin you take regarding the accident. If you develop any soreness or pain following the accident, you need to see a medical professional, not only for your own well being, but for the sake of having additional official documentation. If you end up with major medical bills from an accident that was not your fault, you should not have to pay them, they will be the responsibility of the other parties insurance company. 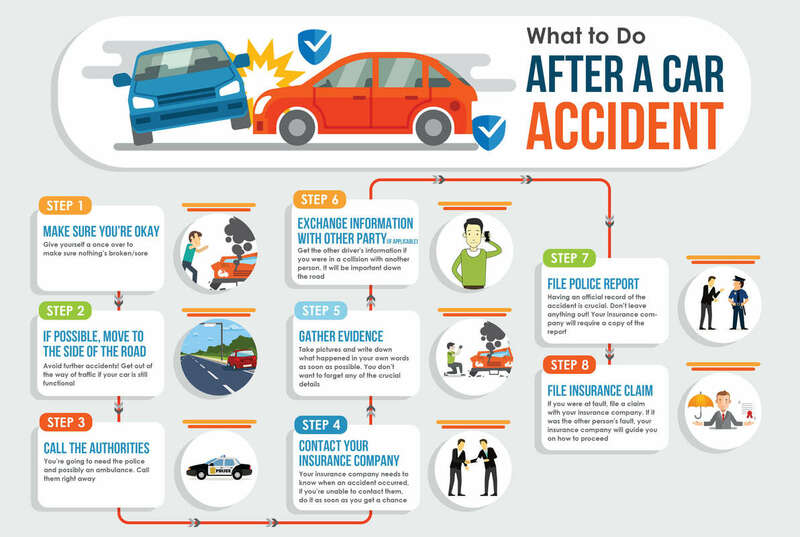 Keeping records and being proactive after your accident will help you be made whole again. Be sure to be diligent and follow all instructions from the police and insurance companies so that you can get back on your feet in the least time possible.